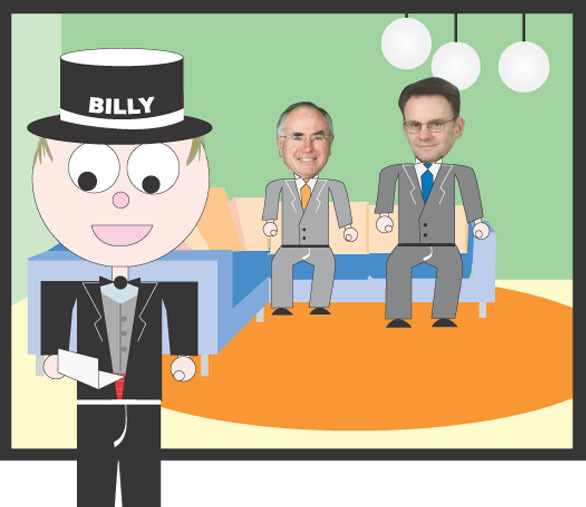 After accepting channel 10's invitation to host their election coverage, Billy delivers the verdict that disappoints a nation and throws the national wing of the Labor Party into undeserved turmoil. Shame, Australia, shame. I've never been so deeply ashamed to be Australian! How could the Australian public be so damn stupid and fall for all the lies and stuff... re-electing John W. Howard..
Now my fears lay in America's Election in November! I really hope they get rid of George W. Bush Jnr. before the world becomes even more un-safe!! ..We'll know if there really is a god, in November!! Would you like your photo taken with Billy? Simply email me a photo of yourself (leaving enough room for Billy to be inserted). You can make it look like you're hugging him, shaking his hand, whatever. However, what Billy is doing and what he is wearing will ultimately be up to me to decide. Send your pics in today!